Use only the best ingredients but by doing so, you subject yourself to higher costs, and potentially unavailable items. Sometimes you need to be creative. While I like living above whole foods, shopping there for spices, especially in large amounts, drives up costs significantly without much benefit to my guests. I am totally fine with high food prices, if I am showcasing an item but not when I can get it in bulk and cheaper. 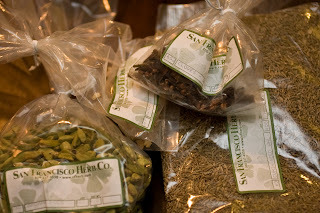 Here, these spices/herbs from SF Herb Co, do come in larger quantities, like by the pound, but they are significantly cheaper. So what happened here? I bought 40 bottles to divide up spices among my friends. The quality is incredible from this place. Friends benefit from handpicked items, and I turn over my spice collection quicker.